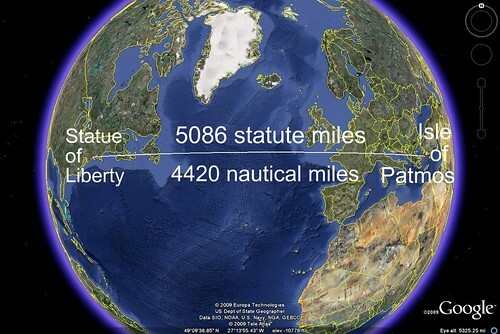 The Statue of Liberty and the Isle of Patmos are amazingly synchronistically connected to Biblical end-time prophecies, spec. 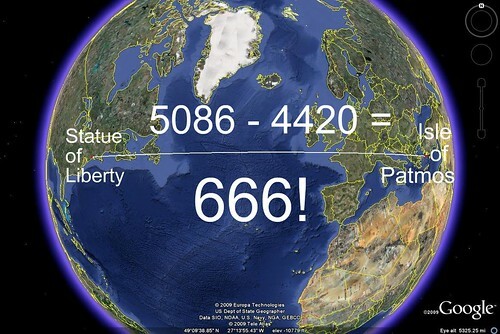 the Antichrist, via the Time/Distance Correlation. The Statue of Liberty stands with her torch of "illumination" raised high for the world to see, signalling, to all who approach her, for all who have "eyes to see", that they are entering the new world, a.k.a. New World Order, a.k.a. Antichrist-System, a.k.a. "The New Babylon". The Isle of Patmos is where the Apostle John received the "Apocalypsis" of Jesus Christ, the Revealing, the Unveiling of Jesus Christ, in all His Glory (Who will also be revealed in the last time), in which was revealed the fall of the aforementioned second 'New Babylon' system of the last days, headed by the Antichrist, the Beast, whose name/number is 666. Our Great and Glorious God has encoded these truths in His very Creation, ready to be revealed in the last time, to all who have "eyes to see".